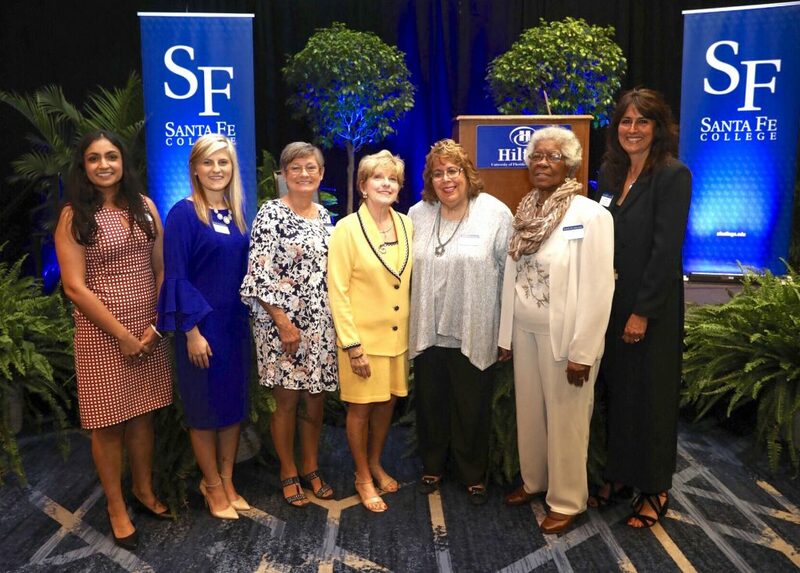 The 2019 honorees (left to right) Nilanjana Sengupta Caballero, Emily Acevedo (Woman of Promise), Linda Lee, Layne Sasser (Honorary Woman of Distinction), Carol Bosshardt, Gussie Lee and Fran Maris. March 27, 2019 – Seven outstanding women in Alachua and Bradford Counties were honored at the 33rd annual Women of Distinction luncheon at the UF Hilton Wednesday. The Santa Fe College Women of Distinction was created by the Women’s History Committee at SF in 1987. Women of Distinction has honored more than 180 exceptional Women of Distinction and 17 Women of Promise in the community since its inception and acknowledges new women each spring at the formal ceremony. This year Carol Bosshardt, Nilanjana Sengupta Caballero, Gussie Lee, Linda Lee and Fran Maris were named as Women of Distinction and Emily Acevedo was the 2019 Woman of Promise. This year’s event also saw Layne Sasser honored as an honorary Woman of Distinction for her 17 years of service to the college. The Women of Distinction have also helped to raise funds for two fully-endowed scholarships and should have enough raised for a third scholarship before the end of the year. The Women of Distinction continues to accept funds to build the scholarship to benefit additional students each year in perpetuity.